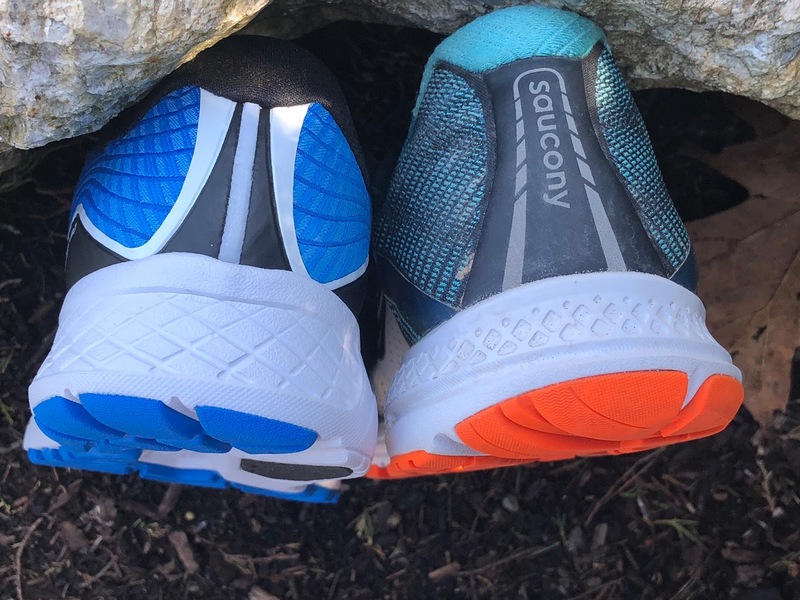 Road Trail Run: Saucony Ride ISO Review: The ride improves yet again! The upper challenges. 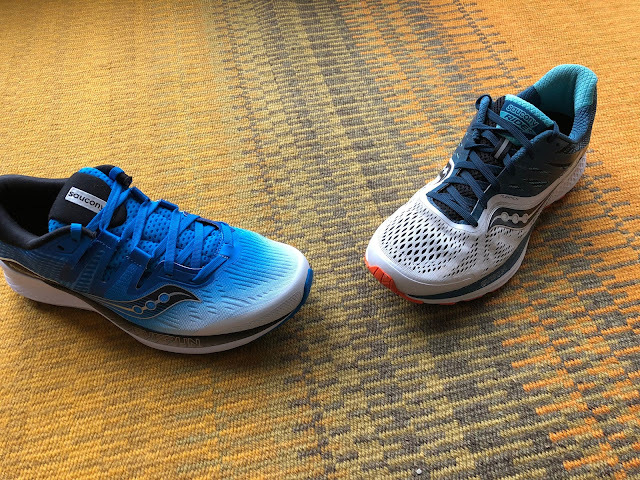 Saucony Ride ISO Review: The ride improves yet again! The upper challenges. 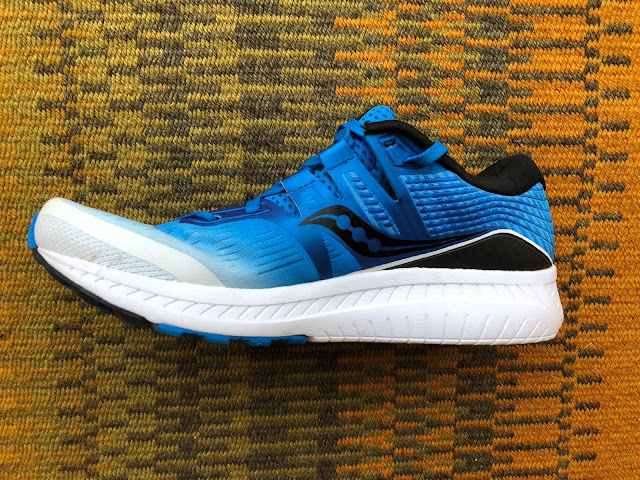 Sam: The Ride ISO is designed to provide a lively, cushioned training ride and underfoot durability for day in day out training at moderate to faster paces. 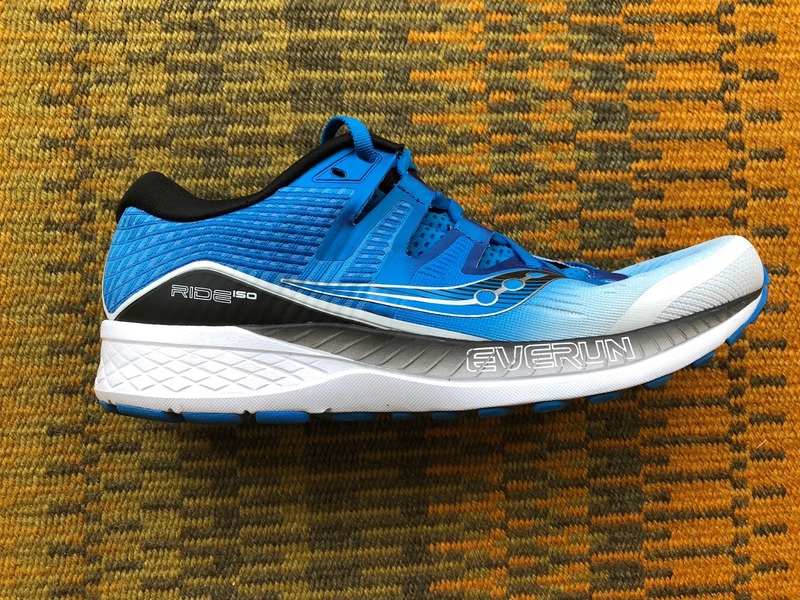 The Ride is Saucony’s entry into the daily trainer sweepstakes competing with shoes such as the Brooks Ghost, Asics Cumulus 20, Skechers Ride 7 Salomon Sonic RA, and New Balance 880. With the ISO version, essentially Ride 11, the big news is a new ISO Fit upper, small changes to midsole geometry and bigger changes to the outsole coverage and geometry. Do these changes help the Ride retain our Ride 10 review title “What a Daily Trainer Should Be”. Read on to find out. 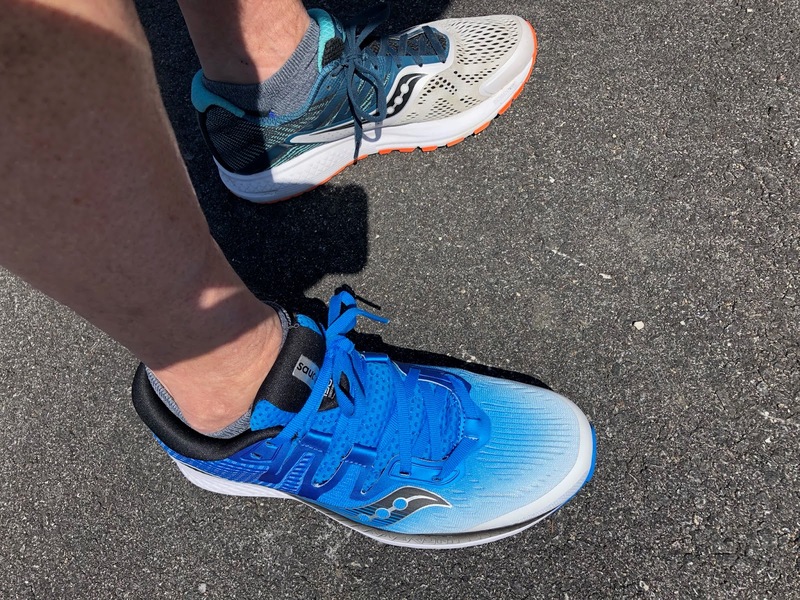 Dave: The Saucony Ride 10 was a solid daily trainer for me last year. I easily pounded almost 500 miles out of my pair and came back for another late in the Fall because it simply got the job done. The Ride ISO’s new softer ISO upper, intrigued me. I’m totally digging the new Kinvara 9 and love the pop of the Everun topsole in the K9. Ride 10 ISO is hopefully the shoe that can let the K9 rest, so I can use the Ride ISO for longer runs and recovery days. Sam: The Ride ISO fit me true to size in contrast to the Ride 10 where I was a half size up. Length was spot on. The try on is super comfortable and all seemed fine. 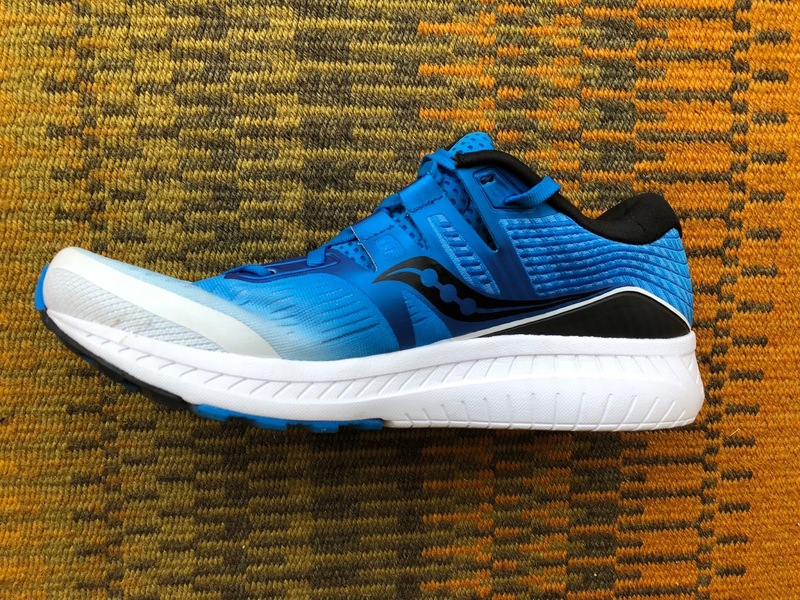 Compared to the Ride 10, the fit at the metatarsals, a snug area in the 10 even in a half size up when I tested, is more relaxed due to the upper material and a redesign of the first lace loops and overlays including logo which are now made of are far softer, more pliable materials. The engineered mesh is very soft and very pliable, one of the softest and most pliable of any 2018 shoe I have run. It is made of a dense weave of very fine threads. It is far softer than the relatively stiff, dense and that thick mesh of the Ride 10. I think this contributes to a considerably more comfortable front of the shoe fit. My foot there was well held and secure. There is no question it will accommodate somewhat higher volume, wider feet upfront with a 2E wide version also available. The mid foot now features Saucony’s ISO Fit with the tongue still having a bootie construction with the bootie now extending further back. The soft theme continues at mid foot and herein lies some issues. The combination of soft upper, the wide opening between lace sides, unstructured soft and more lightly padded tongue and thin and pliable deeply notched ISO Fit straps make the foot hold challenging for my medium to narrow lower volume foot. During my first 10 mile run I had to cinch way down to keep the rear of the mid foot secure leading to some aches and pains towards the rear of the arch on the medial side. My second run, I used the rear medial lace hole and heavier socks and hold was improved but I still had to cinch down further than I would prefer leading to some lace bite. If the tongue was firmer, the rear straps and ankle collar beefed up and not as deeply notched and better connected to each other I think the fit would be more secure. The upper’s last ISO Fit strap is just to pliable and deeply notched and doesn’t tie to the sidewalls of the ankle collar as well as it should, or as executed in the Triumph ISO 4 see above) where the foot hold is fine. While higher volume feet should be happy here, the Ride ISO just does not have the mid foot hold of its predecessor. While the Ride 10’s secure mid foot could make it a choice for those seeking some pronation support here in combination with some changes to the outsole, less coverage at mid foot I think less so. Dave: My size 9 is spot on with no issues. I immediately noticed the upper changes in Ride ISO vs. Ride 10 (2017). It’s a softer engineered mesh that looks like it should wrap your foot very nicely. Unfortunately, I think the ISOFit is where the shoe is ruined in my honest opinion. If you see the attached photo (below) you’ll see an excess amount of material within the tongue, that runs the length of the “throat” of the shoe. In the Ride 10, along with Sam, I struggled with the shoe putting far too much pressure on the top of my metatarsals. My foot would even be bruised post run in the Ride 10 due to this, but I made it work. Did they fix it with ISO fit? I don’t think so. I still am getting a ton of pressure on my metatarsals laced as they need to be to hold my foot. I think Saucony went and tried to “beef” up the padding, but went way too far here by using excessive and overly soft materials. The detached ISO Fit moveable eyelets, at least for my foot type (narrow) need to be excessively cranked to get the snug fit I like, and with the detached ISOFit eyelets at the tongue, I have to get very creative, via lacing locking, to make sure I’m not sliding around. Long story short, a very solid shoe in terms of functionality (see Midsole and Ride sections) was ruined by ISO Fit. Saucony really needs to go back to the drawing board on this. It doesn’t work with many foot types and I’m not the only runner saying this. It baffles me to see so many run brands be so focused on midsole technologies, but they forget one of the most important key elements in making a running shoe….the fit!! Easiest fix for this shoe? Use the same lacing system with the Pro Lock strap as the Kinvara 9 has!!! 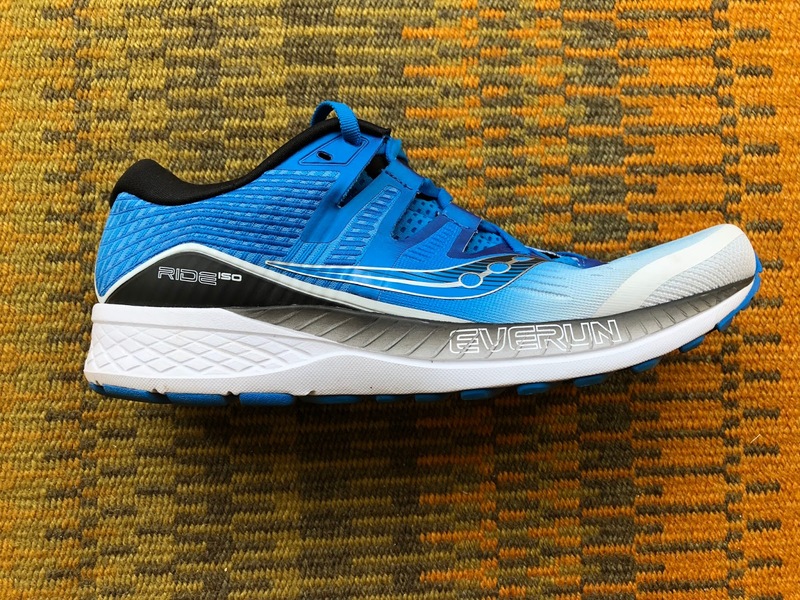 Sam: The Ride ISO retains the PWRFOAM of the Ride 10 with its Everun topsole. There is new midsole contouring to have the foot sit further into the midsole for increased stability. I must say I did not notice this change running with the 10 and ISO one on each foot before seeing this change in the specs as the Ride 10 was already plenty stable. Could this change have more to do with supporting the foot higher up given the new ISOFit upper? and also to a more vertical medial sidewall than Ride 10. The midfoot midsole cavity is both broader and shallower. I assume that this change, along with less outsole rubber at midfoot provided the faster and noticeably smooth transition from heel to mid foot as well as slightly softer and less jarring landing feel. 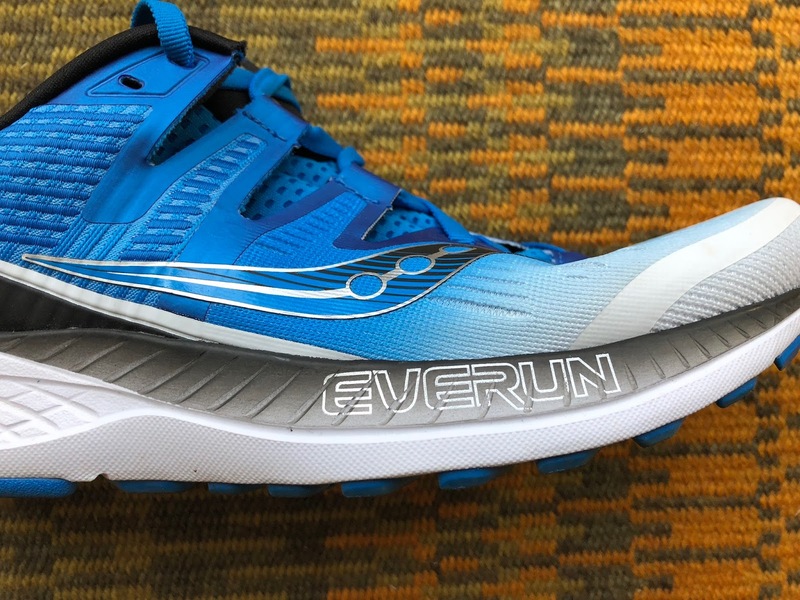 The EVERUN branding on the gray painted background is largely cosmetic as the EVERUN itself is a thin top sole below the sock liner and sits on top of textile and glue Strobel board. The EVERUN layer does provide a touch of softness and rebound but is not a major factor in the midsole feel for me from what I can tell here or in the Kinvara 9. This said it may mask the firmness of the PWRFOAM and if this is the case it is effective in doing so. Dave: PWRFOAM midsole really gives you a pleasant ride (literally) - - That combined with the EVERUN topsole, the shoe is smooth as silk. Other than me locking down a nice fit, via the poor ISO Fit, this midsole really gives you the pop you are looking for in a daily trainer. If you were a fan of the Kinvara 9 (see review) just imagine more of it. The Ride ISO has thet smooth transition of the K9, just built for the longer haul and more weekly mileage. It makes a better recovery day shoe, as well. Saucony hit the nail on the head here. Dave: A modified Tri-Flex outsole and a more contoured midsole side wall, compared to last years Ride 10, give the Ride ISO have substantially more fluid road feel. I enjoyed the “beefy” tread as well. You can tell this baby is a true workhorse. The Ride ISO also handled wet sidewalk and dry cinder rail trail very well on my test runs. Sam: I agree with Dave that the Ride ISO has a substantially more fluid road feel and that the outsole plays a big role. Saucony removed a segment of outsole on the medial mid foot, and due to this plus the less beveled more embedded heel, the transitions were very smooth with also noticeably less “thunk” on landing. 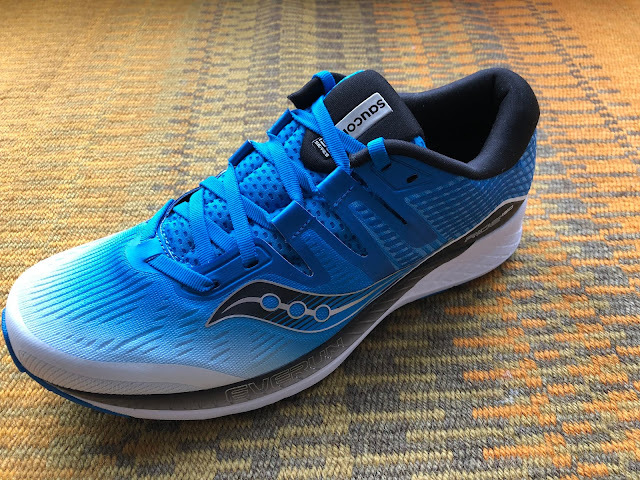 Further forward Saucony narrowed the Tri Flex bars, now including two deeper longitudinal grooves whereas the Ride 10 had five very narrow shallow ones. The result is a slightly softer, more fluid and more dynamic toe off. Dave: It’s smooth, just the way a daily trainer should be. I think we get a bit hung up sometimes on racers and lightweight performance trainers, in that they need to be smooth and we forget the general workhorse daily trainers. The ones for big boy and big girl miles, and those recovery days that we want to feel effortless. The Ride ISO gives an enjoyable, yet snappy, vibrant ride. My legs feel great post run and when laying on the gas. I did a hard 90 min Progression run in them as part of the testing and they were quick enough to get the job done. It honestly feels a ton like the awesome Kinvara 9, just tuned up for more miles. Sam: I agree wholeheartedly with Dave on the ride of the… Ride. It is smooth, well cushioned and is neither over firm nor over soft. Steady and able to handle any training pace, the new outsole configuration also plays a huge role in smoothing out what was already a great ride. One on each foot the difference was clear. The fine Ride 10 landed and took off more ponderously with more shock front and back and as stated above a thunk like feeling. The Ride ISO was a touch softer overall or at least the sharp edges have been cleaned up. Toe offs were not as stiff feeling which may also be in part due to the more pliable upper upfront. The only issue is the upper which was not as seamlessly connected to the ride as I would like. Both the need to over tighten over the soft tongue and the less than secure hold of the last ISO Fit strap got in the way of the wonderful underfoot experience. Dave: All in all, I really enjoyed the Ride ISO, but for me, and am curious to see what others think, it is ruined by ISO Fit. I spend more time in this shoe worrying about my feet and the fit, than actually enjoying the benefits of a superb midsole and running experience. Even with that, I will continue to train in it because I like the road feel, but for long runs. I cannot be worrying about having to stop every 45 mins to lock my foot back in. I would recommend this shoe for the runner with more of an average foot width than a narrow one. Wide footed and narrow footed runners may struggle due to the poor ISO Fit. It is also available in 2E wide. It will be pulled from the shoe rack for those easy days, long runs and recovery days. Again, if you can figure out ISO Fit, you have yourself one of the best shoes out there right now for mileage. But if you are going to struggle like I did, just go get the Kinvara 9 and really see where Saucony is shining in 2018. Sam: Underfoot this update improves an already stellar and versatile daily trainer road ride. Steady with a light touch of lively bounce the Ride ISO has just the right level and firmness of cushion for my daily miles. I enjoyed all paces in the shoe and its connected road feel. I particularly liked that the transitions back to front were smoother, less abrupt, and with reduced impact shock compared to Ride 10. Up top while the toe box and metatarsals area is distinctly improved in comfort, the mid foot, which before was just about right, is now sloppier and for me harder to dial in the fit. Soft, pliable uppers require careful design attention to foot hold and here, unlike the superb Kinvara 9 also with a light pliable upper, Saucony went for a fit which may be fine for somewhat wider feet than mine but is not as easily tuned for narrower, lower volume feet. I got there with the use of the rear lace hole but still had to cinch more than I would like. It may also not work as well as the Ride 10 for those needing some medial pronation support from their upper. The Ride ISO nonetheless has a superb ride and will work for many, just make sure you carefully try it on for fit and try to run them a bit as the try on fit may feel fine but the run fit and support may not be as good. All of this said I will continue to train inthem and fiddle with the lacing and socks as the ride itself is a delight. -1.5 for upper hold issues, overly soft tongue and not substantial enough last ISO Fit strap, all related to the soft quite unstructured upper material itself. 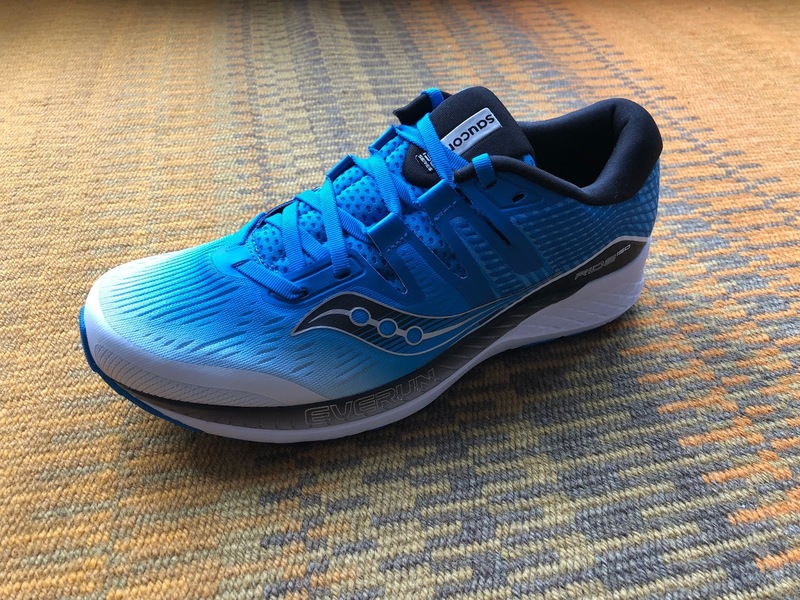 Stick the upper of the Kinvara 9 or even of the Triumph ISO 4 on the Ride ISO and it would be very close to a 10. Dave: Metatarsal pressure and bruising in Ride 10 vs. an unsecure fit in Ride ISO. That’s really the story between the two. Ride ISO definitely packs a better punch in terms of snap and boasts a better engineered mesh upper. I’ll go with Ride ISO for a win, because it has a far better road feel for 2018. Sam: Despite the upper issues which for some may not be issues the improvements in ride almost always win out for me so I will give the nod to Ride ISO and keep playing with the lacing. Sam: The ounce heavier Triumph has a full Everun midsole leaving all EVA behind. It is somewhat more cushioned and not nearly as lively and has a a more ponderous transition. Its ISO Fit upper, while of a similar design, is just different enough in its more substantial materials and in that last strap to be effective whereas the Ride ISO's leaves something to desired. As I prefer a livelier daily trainer nod to Ride ISO. Dave: It’s not even close here. The K9 is one of the best shoes of 2018 so far. I’m already into my 2nd pair and they are smooth, fast and just plain fun to run in! If you can master the ISO Fit in the Ride, definitely own both and use the Ride for those longer mileage days. Sam: Different shoes for different purposes. 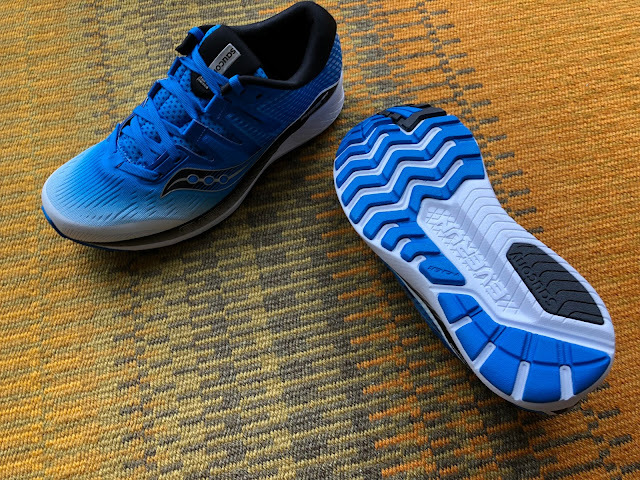 On the surface Ride 10 the daily trainer vs. Kinvara 9 the performance trainer and racer but the Kinvara 9, with the cavaet of less mileage life per pair, can also train just fine, and it races too. Add to that good mid foot support and excellent fit for me clear nod to the Kinvara 9. Dave: Ride ISO takes it. Freedom ISO 2 9 (review soon) is far too soft and I am beat up post run in them. They lack the pop in the forefoot I get in the Ride ISO and are just kinda dull. My stride feels “sunk” almost similar to most Hoka for me, and I have to work much harder to keep a smooth efficient stride. Sam: I ran the Freedom ISO 1 and while a blast it is an occasional shoe for me as it suffers from a soft, bouncy and not well directed ride. It shares much of the sloppiness in foot hold of the Ride ISO at mid foot while being quite snug upfront. Ride ISO warts and all is a more versatile shoe for me. Dave: The Ride 7 smokes the Ride ISO. Get outta my room! You can’t be in here Ride ISO. The Ride 7 is one of the best shoes of 2018 and I’m already on my 2nd pair as well. It’s faster and far more efficient, via the snappier midsole in FlightGen. Sam: Up top the Ride 7 is distinctly superior with a fabulous balance of comfort and security. Underfoot while bouncy and fun, reminding me a bit of the Freedom, but with much better manners, the Ride 7 while lively is just not as stable or steady for me as a day in day out trainer, nod to the Ride ISO. 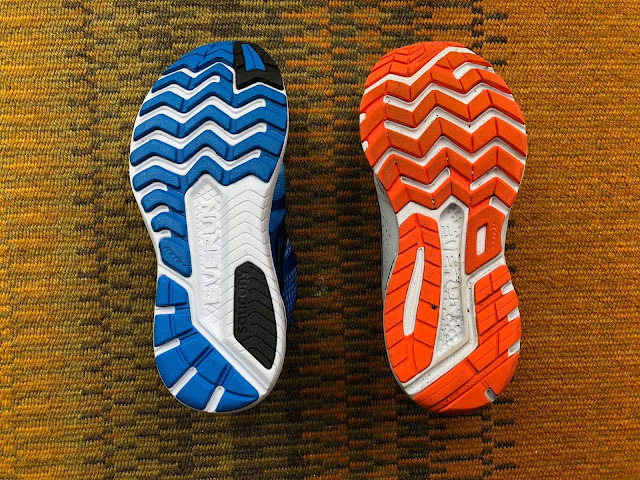 Sam: There are some similarities for sure in the foam's cushion feel with the 2 oz lighter Epic React-and that weight difference is noticeable, a touch softer but with a stiffer front outsole which had me struggle more with toe off more than in the Ride. Before that front toe off the Epic React underfoot may be a bit smoother but.. its very snug upper clearly got in the way of transitions for me. Snug at mid foot and to the front it is no where near as comfortable as the Ride ISO's and I have nothing against snug uppers but here... Strange as while the Ride ISO's upper has the opposite characteristics of being to easy going the Epic React's gets in the way of moving forward. Nod to Ride ISO. Dave: Ride ISO all day. Fresh Foam is unrunnable in most of the NB line for me and needs a serious overhaul. 1080 is a clunker. Sam: Ride ISO any day for me, if it wasn’t for the upper. The 1080v7 is ponderous, stiff and heavy in comparison with only marginally if at all more cushion. The 1080 has a superior upper for sure. This said nod to the Ride ISO. Dave: Ride ISO. The coming soon Clifton 5 debuts a new engineered mesh upper, but continues to make me work far too hard in the shoe, given its maximal principles and softness. I leave a run beat up, with excess pain in my shins and the muscles surrounding. The Clifton 5 is dull. EVERUN and PWRFOAM pack more of a vibrant ride for me, which I enjoy a lot. Sam: Hands down Clifton 5 for upper and fit. I prefer the denser more stable cushion of the Ride ISO and at all paces. The Clifton 5 (unchanged for all intents and purposes underfoot from the 4) is to soft at slower paces for me and but very lively off the heels at faster paces. Nod to Ride ISO for pace versatility despite its upper. Dave: Yes, they may be in different categories on a shoe wall (hardly) but this is an interesting matchup, because they both have great midsoles, PWRFOAM vs. Brooks' BioMoGo DNA. I really enjoyed the Ravenna 9 (light light stability) and put almost 400 miles on it so far. Ride ISO struggles with the ISO Fit and my foot, so Ravenna 9 for the W.
Sam: Lighter with a superior fitting and holding, if not as comfy upper, the Sonic RA is a bit firmer, more stable and stiffer but with excellent vibration attenuation. The transitions are similar with the Ride ISO a touch smoother and the Sonic RA more responsive. Nod to Sonic RA. Sam: The Ghost is a touch more relaxed and easy going top to bottom. It’s upper is actually roomier all around, a touch to roomy for my narrower foot but nonetheless I am well held. Underfoot the extensive segmenting of the Ghost outsole makes a similar firmness of cushion a touch more forgiving, easier to run at slower paces but overall with less response and snap than Ride ISO. Torn on this one as even outfitted with the somewhat snug upper of the Ride 10 the Ride ISO would be the clear winner for its ride. For being polished and complete with no issues, if a bit less of a faster daily trainer, very slight nod to the Ghost. Sam: Very close these two.. The Cumulus has considerably more upper support especially from lace up to heel where the Ride lacks it, maybe a touch too much with a relatively stiff upper and giant heel cup in comparison to Ride ISO. The Cumulus is stiffer and firmer and not quite as fluid but has great response and a combination of firm and soft underfoot which works well for me. Very slight nod to Cumulus as a daily trainer has to provide consistent support, even if it has not quite as pleasant and fluid to run as the Ride. The Ride ISO was provided at no cost. The opinions herein are entirely the authors'. need to look elsewhere when the Rides are done... I had big hopes for the Ride ISO and will of course try them, but based on your experiences I Will probably need to find something else when my Ride 10s (and my Guide ISOs...) are done. Thanks for a thorough and great review. I´m sorry to say, but Saucony´s ISO fit is such a gimmicky crap, totally useless! Same here (narrow feet, medium high arches), i had the same fit issues with the ISO fit upper of the Freedom ISO. At the end i gave up on them as i couldn´t find a pleasant AND secure foothold. And man, i really tried, i really tried hard, i think i´ve never tried so many different lacing techniques on a shoe ... 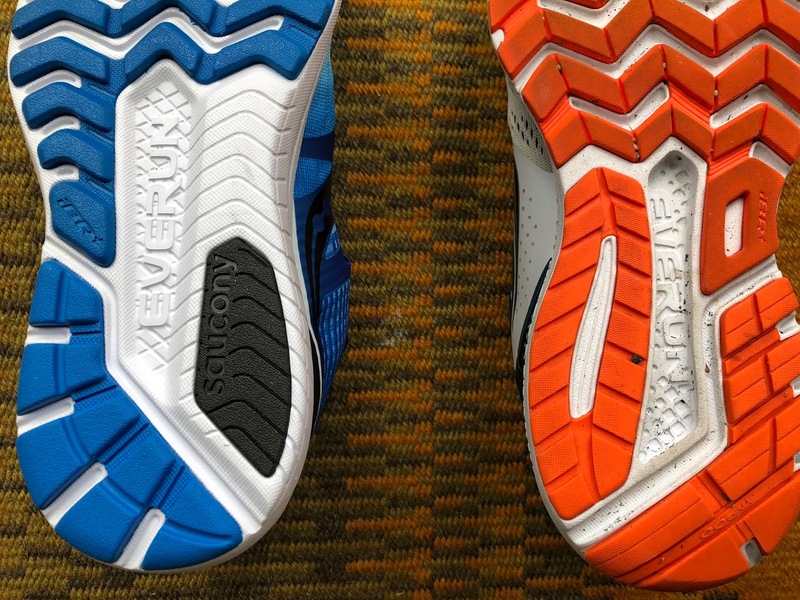 I really hope Saucony overthinks its ridiculous ISO fit design and gets rid of it, instead of ruining their whole product line with flimsy and poor fitting uppers. Great review. Looking forward to the Freedom ISO 2 review. How’s the ride of the FI2 vs the Liberty ISO? LIverty ISO vs Freedom ISO 2 will be an interesting comparison as both seek to improve the support of the original Freedom. I am awaiting my pair of Freedom and will let you know here and of course in the review. Just got my pair of Iso Rides and some quick measurements confirmed they are a taller shoe (21mm/29mm), compared to the 10. They are also not as wide in the forefoot by a few mm, and the insole is thinner. I believe they scaled down the width of the forefoot (that is really excess), and made the insole thinner to increase the flex in the forefoot. Flex groves seem deeper too with more toe spring. Helps with the Ride and flexibility- as you guys have found. Seems like the toe box is a little higher now too. I haven't had a problem with the ISO Fit so far. I believe they are a little more padded/plush around where you lace at the top-which helps take pressure off that area for me. I like the slightly looser feel in the mid-foot, and in a trainer I don't like to tighten the laces as much as a racer. Over all it feels more like the big Brother of the K9 now, IMO. Should be able to use these on easy days, the K9s on speed and longer days. Hi Anonymous, Thanks for your careful and helpful analysis! You seems pretty disapointed about the Freedom Iso 2 ! I was thinking to wait for the Freedom Iso 2 to replace my Freedom (love them! ), but this year, maybe the kinvara 9 is a better option ? I right now train in the Saucony Triumph iso 4 and I’m not really in love with it. I’m a 190 lb. runner and feel the cushioning bottoms out in it on a run producing a harsh ride. Walking around in it the cushioning feels soft. When I begin my run the cushioning feels soft, but soon starts feeling very harsh. I never had this problem with the previous Triumphs. Was wondering if you feel the Ride iso would work better for me. Thanks for your input. Guys this review is really excellent, I admit I wasn't aware your work... so for me this is a real find! great work, thank you! 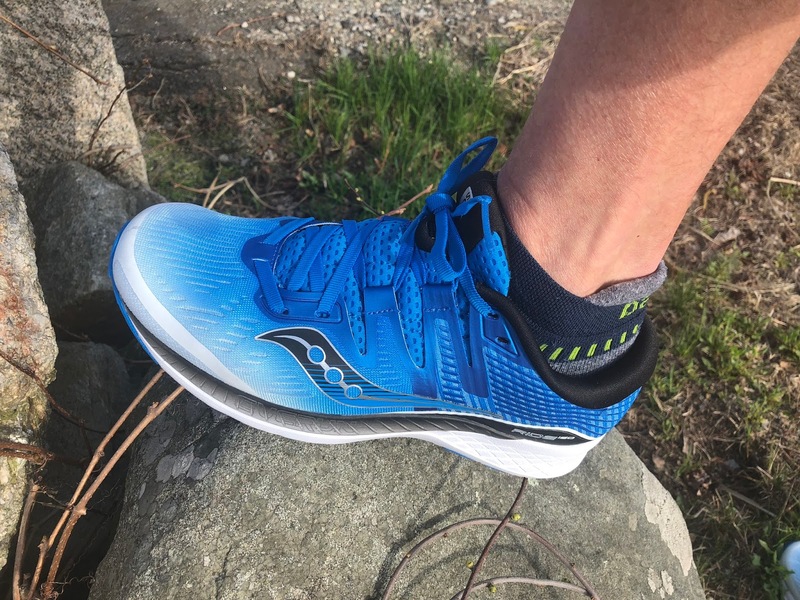 I run in kinvara 8s, I like them a lot for races and fast work but I have had trouble finding a shoe for long runs (eg over 10 miles for marathon training). I bought the freedom ISO but have trouble with the lack of upper structure, and also their rain-permeability which is a problem in London. So I might try the Ride, but what else would you recommend to try - essentially I am looking for slightly better structured Freedom. Thanks for reading and kind words. Agree the Freedom doesn't have much support. The new Freedom 2 should improve that. The Liberty ISO is also more supportive upper and underfoot but I wouldn't personally pick it as a daily trainer for the marathon. Not much you can do about water except to get an upper that drains well and doesn't absorb to much. You might first consider the Nike Pegasus 35, Hoka Mach, Kinvara 9, the upcoming Brooks Ghost 11,-review soon, the adidas Solar Boost if it fits you, the Under Armour HOVR Sonic (low water absorption) , and Asics Gel Cumulus 20. Reviews of all please see below. 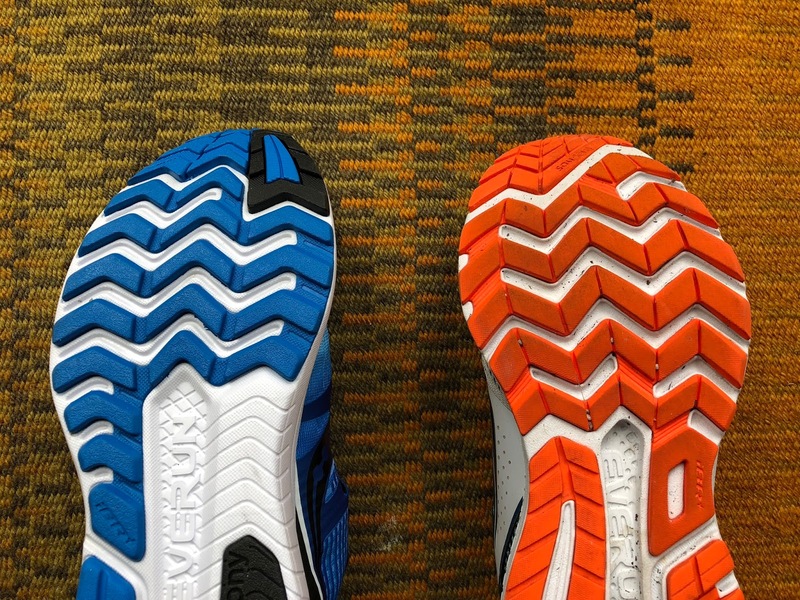 I have just been searching the internet for a review on the Saucony Ride ISO which matches my own experience, and yours is the only one I can find. I have used the Saucony Ride for the last four years, and always been happy with it whatever the changes to the design. However, I can't get on with this version at all because of the ISO fit upper. I feel as if the shoe is too big for me, even though it's not - it doesn't hold me properly in the middle of the upper, to the extent that I feel I'm having to work harder at the actual running. I tried the Triumph ISO a while back and had similar issues with that, though not as bad. For information, I am an older female runner who has always worn a neutral shoe. I have a wider forefoot and narrower midfoot and heel. How many miles did you have on those Ride 10s? I just got a pair and ran once for 16 miles and I'm about half-way worn down on the outside forfoot tread. 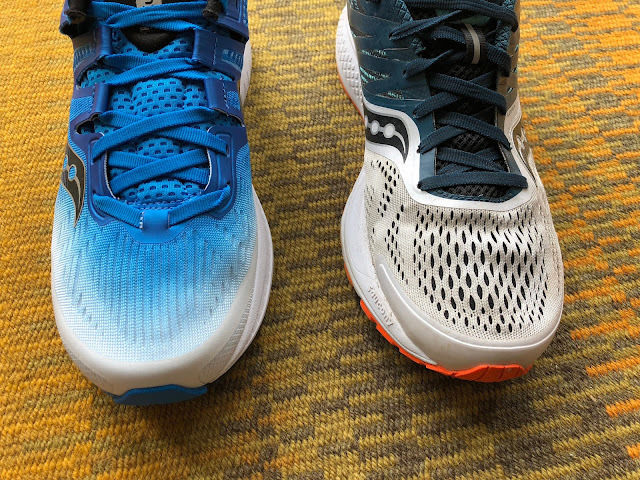 I can't find a Saucony shoe that lasts me longer than 50 miles without being worn down to the white part of the sole (all the way through the colored tread). All I want is a lightweight flexible shoe, neutral forefoot runner, wide foot, and I'd prefer a 4mm drop. Brooks treads seem to last longer but the new Brooks Flow is too narrow (and collects stones). Am I really asking for a unicorn here? Very frustrated with the shoe companies for the last few years. I try to plead with shoe reps but it doesn't seem they push the feedback up the chain. I have about 30-40 miles on mine and no heavy wear but some scuffing. I tend to heel strike you must forefoot or mid foot strike? The unicorn issue is that usually more and denser outsole means less flexibility. You might look at the Reebok Sweet Road 2 as it has very decent rubber and is quite flexible too. It is also $100. Also the Brooks Ravenna is very flexible and has decent rubber. You will find reviews at the link below. Hey team, thanks for the in-depth review. I recently bought the Ride ISO and I'm finding everything you said about the midsole spot on, the cushioning is really really excellent. I just wanted to give a different perspective on the ISOfit system. I have a very wide midfoot which mostly sticks out on the lateral side. Unfortunately for me, a lot of 2E shoes are only wider in the forefoot, meaning even in wide sizes I have a hard time finding shoes that don't put painful pressure on my 5th metatarsal. For me, ISOfit has been a godsend. I'm able to dial back pressure on the tender spots on the lateral side of my foot while still keeping a good lockdown by tightening the frontmost and rearmost straps. I can definitely see how it would be annoying if you had a very narrow foot, but for those of us with huge flippers I think ISOfit is great. Thanks for your perspective from the wide foot side of things! Glad they fit you well.